I am passionate about engaging the public in studying, understanding, and celebrating the biodiversity associated with our every day lives. 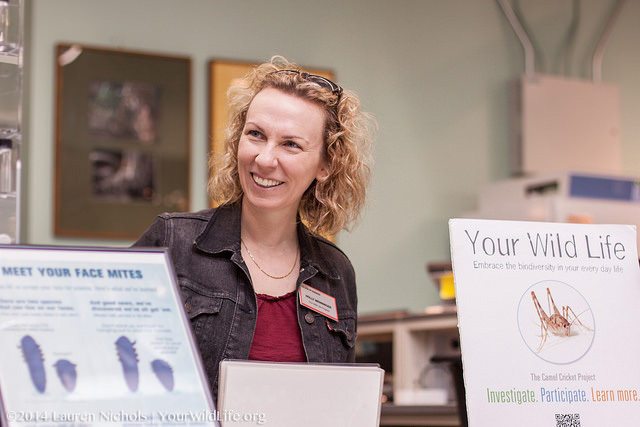 As Director of Public Science, I coordinate the citizen science projects and online science communication activities affiliated with Your Wild Life. An entomologist by training, I’m science communicator by passion and practice. My research interests lie at the intersection of science and society. I’ve investigated the consequences of human activities on ecological communities and processes – from the effects of cleaning habits on the bacterial diversity in our homes to the consequences of land-use change on stream ecosystem function. I am passionate about engaging the public in the process of science and moving the outcomes of research into the hands of people who need it. Pouyat RV, Weathers KC, Haueber R, Lovett GM, Bartuska A, Christenson L, Davis JLD, Findlay SEG, Menninger H, Rosi-Marshall E, Stine P, and Lymn N. 2010. The role of federal agencies in the application of scientific knowledge. Frontiers in Ecology and the Environment 8: 322-328. Palmer MA, Menninger HL & Bernhardt E. 2009. River restoration, habitat heterogeneity and biodiversity: a failure of theory or practice? Freshwater Biology 55 (s 1): 205-222. Menninger H & Gropp R. 2008. Communicating Science: A Primer for Working with the Media. Washington DC: American Institute of Biological Sciences. 54pp. Menninger HL, Palmer MA, Craig LS & Richardson DC. 2008. Periodical cicada detritus impacts stream ecosystem metabolism. Ecosystems 11: 1306-1317. NC State News February 2, 2016 – Features research from the Armpit Microbes project. The New Yorker November 4, 2015 – Features the research from the Wild Life of Our Homes project. Greensboro News & Record June 10, 2013 – Features the research of Holly Menninger et al. Discover October 30, 2014 – Features the research of Mary Jane Epps et al. Time September 3, 2014 – Features the research of Mary Jane Epps et al. The Atlantic CITYLAB June 3, 2014 – Features the research of Holly Menninger et al.